I really enjoyed the location, the people, and the food! Everything was exceptional and exceeded my expectations. The people were so friendly and helped me out whenever I encountered any concerns or had any questions. The place was phenomenal, and the beaches were spectacular! The owner of the establishment was the kindest person and gave me the best tips and tricks for the best experience. The studio is nice,quite big and well equipped with a balcony with sea view; you can admire sunset as well. Position is convenient; kitchenette equipped, wifi working. Great value for money. la situation au bord de l'eau , le matelas neuf ! Studio mit Meerblick gebucht - die Aussicht vom Balkon war sehr schön! Das Zimmer konnte ohne Aufpreis noch bis zur Abreise am Abend benutzt werden. Отель расположен в Аркасе. Тем, кто едет в первый раз, надо знать, что до пляжа идти пешком минут 20. Но отель действительно в 150 метрах от моря. Прекрасный морской бриз, шум прибоя - все по настоящему! Мы жили в номере с видом на море. Номер небольшой. Есть все необходимое. Мы готовили дома, поэтому нам бы хотелось немного побольше кухонной посуды. Не хватало реально салатника и доски для резки овощей. Все остальное - прекрасно. Новая сантехника, нет никаких проблем с горячей водой (и с холодной). Любезный и доброжелательный хозяин, регулярная уборка, смена полотенец. Да, еще большой плюс - недалеко прекрасный супермаркет и множество кафе. Мы отдыхаем на Карпатосе много лет. Аркаса - наш сознательный выбор. Είχε πολύ ησυχία. Καλά στρώματα για ευχάριστο ύπνο. Le sistemazioni non molto grandi ma pulite e ordinate, venivano risistemate ogni giorno dalla proprietaria. Ogni camera ha il condizionatore ma non è assolutamente necessario in quanto l'esposizione consente di beneficiare sempre di una piacevolissima brezza e la sicurezza di Arkasa consente di dormire con le porte aperte!!! Avendo prenotato all'ultimo momento non abbiamo avuto la vista mare ma in ogni caso il doppio balcone era grande e confortevole (tavolino,sedie,ombrellone). Inizialmente avevamo prenotatonsolo per 4 gg ma poi abbiamo deciso di fermarci di più e non c'è stato nessun problema,anzi il proprietario si è prodigato per trovarci una soluzione. In questo secondo alloggio sempre presso la struttura avevamo anche una vista mare fantastica! I proprietari davvero gentili e disponibili!!! Consigliata vivamente come soluzione anche per periodi non brevi! Lock in a great price for Annita Studios – rated 8.2 by recent guests! Located in the village of Arkassa, Annita Studios offers self-catering accommodations with free Wi-Fi access. It enjoys panoramic views of Paleokastro and Finiki. Annita rooms are bright and simply furnished. Each comes with a kitchenette with fridge, a satellite TV and a safety box. All units also feature a private balcony and a bathroom with hairdryer. Air conditioning is available at an extra charge. 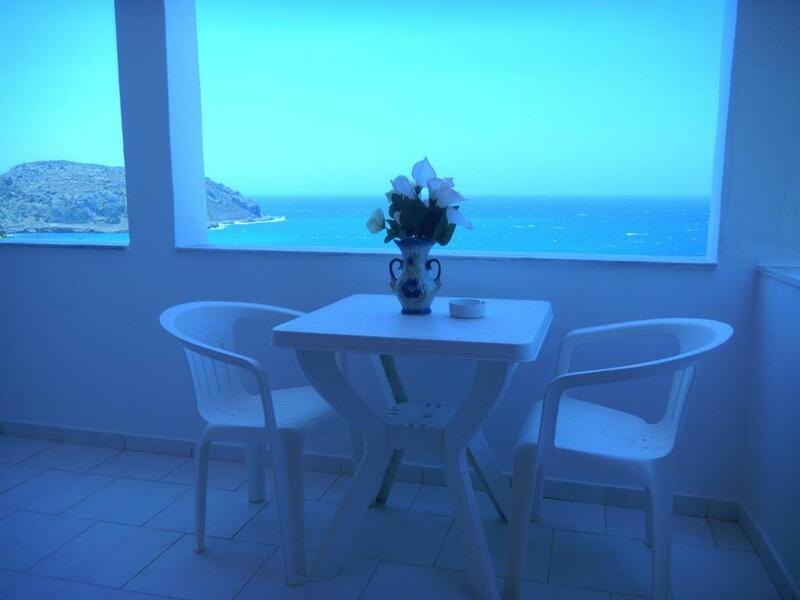 The main town of Karpathos is a 20-minute drive from Annita. Karpathos Airport is at 5.6 mi. Free parking is available near the premises. When would you like to stay at Annita Studios? 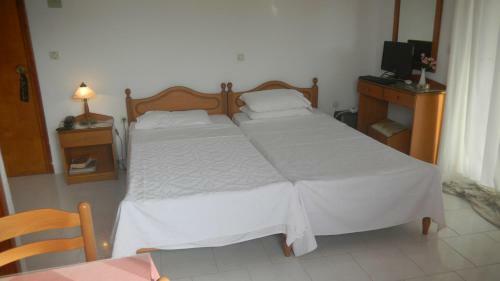 Air-conditioned, double-bedded studio with sea view. It includes a kitchenette with refrigerator, kettle and coffee maker. Other facilities include a hairdryer, satellite TV and a selection of free movies, safe and telephone. Featuring a private balcony with garden views, this air-conditioned studio includes a well-equipped kitchenette, satellite TV and a selection of free movies, safety box and hairdryer. Enjoying mountain views, this studio includes a hot plate, mini fridge, electric kettle and coffee maker, as well as a fan, safe and satellite TV. A hairdryer can be found in the bathroom. House Rules Annita Studios takes special requests – add in the next step! Annita Studios accepts these cards and reserves the right to temporarily hold an amount prior to arrival. Please inform Annita Studios of your expected arrival time in advance. You can use the Special Requests box when booking, or contact the property directly using the contact details in your confirmation. The only thing is that there are few modes of transportation in the off season. So I do recommend renting a vehicle if possible. If not, there is a taxi driver located right next to the hotel. It is a bit pricey, but if you have no other way to get around, it isn’t too bad.